In two separate radio interviews (Dallas & Atlanta), I would tell the predominantly Black audiences that before the White boys from the North come to the South spray painting Confederate soldier monuments with the message, “Black Lives Matter”; they should buy as many mirrors as they can and place them in every Black community, starting with Obama’s and Emanuel’s Chicago, before they are caught and punished to the fullest extent of the law. “And then they should go to the Capitol Mall in Washington, DC and spray paint that message on the monument of Lincoln and every Union soldier monument they can find. I would tell them about a letter written to Lincoln by a Black woman, Ms. Hannah Johnson, and delivered by her White friend, Ms. Carrie Coburn, begging Lincoln to instruct his Union doctors to care for the wounded Black soldiers of the 54th Regiment of which her son served. The doctors refused to touch the Black soldiers. Ms. Johnson went on to ask that the Colored troops also receive equal pay. Lincoln did not respond to her letter, but told Fredrick Douglas that the employment of Colored troops in the first place was a great gain to the Colored people, but their enlistment was a serious offense to popular prejudice. To not receive the same pay as White soldiers seemed a “necessary concession” to smooth the way to their employment as soldiers (putting it mildly). In the integrated Confederate army where they were not even there legally, the White Confederate soldiers divided up their pay so that the Colored troops would receive the same pay. And just as they were attended by the same White doctor before the War, they continued to receive the same care during the War. I would tell them that the only people to ever care for the lives of the African people in America was and still is the Southern White folks, bar none. God bless you! Nathan Bedford Forrest’s statue and burial site are in Health Sciences Park, formerly named for the Confederate general. A state appeals court has kept alive the lawsuit over the renaming of that park and two others. The Tennessee Court of Appeals has revived a legal challenge to the city’s renaming of three Confederate-themed parks with a Friday, Aug. 21, ruling that keeps only one of the 15 plaintiffs intact. 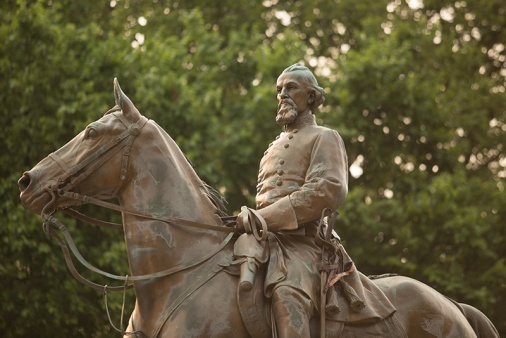 The case involves a lawsuit filed in 2013 following the Memphis City Council’s decision to rename Forrest Park, Jefferson Davis Park and Confederate Park. Shelby County Chancellor Kenny W. Armstrong dismissed the suit, ruling that the plaintiffs had not established that they had a standing in the case. But in its Friday ruling, the appeals court said the Sons of Confederate Veterans Nathan Bedford Forrest Camp #215 does have standing and remanded the case back to Shelby County Chancery Court. The opinion, written by Appeals Court Judge Brandon O. Gibson, upheld Armstrong’s dismissal of the 14 other plaintiffs, including descendants of Forrest, Sons of Confederate Veterans International and the group Citizens to Save Our Parks Inc. The distinction, according to the ruling, is that the Forrest camp of the Sons of Confederate Veterans “suffered a distinct and palpable injury not common to the citizenry at large” when the council voted to change the name of the park honoring the Confederate general, slave trader and Ku Klux Klan grand wizard. It’s new name is Health Sciences Park. The city’s removal of the marker was a pivotal moment that triggered a series of events, including a state law that bars renaming or removing monuments from parks that memorialize veterans and the wars they’ve served in. Gibson also cited the SCV camp’s work in maintaining the park. In a footnote, Gibson clarifies that the organization has standing to challenge the council’s action in renaming all three parks. But it notes the Chancery Court’s options include declaring the resolution invalid only in the case of the former Forrest Park, declaring the renaming of all three parks invalid, or upholding the renamings. Earlier this week, an altercation took place in Hickory, North Carolina, when a young man got insulted. 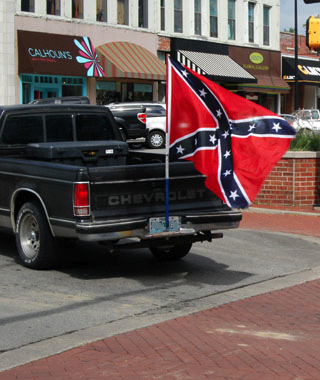 What set him off was a teenager who drove by displaying the Confederate Battle Flag from his pickup truck. But instead of dealing rationally, Caine Morrison got in the teen’s face and confronted him. Then he pulled out a handgun. The episode ended with both parties leaving the scene, and no one was injured. However, Morrison was arrested and charged with assault by pointing a gun, possessing a gun to the terror of the people, and for possession of a firearm on educational property. Morrison was arrested on the campus of Catawba Valley Community College, with the weapon still in his possession. Morrison has a prior firearms charge against him for discharging a firearm with the city limits of Hickory, and he has a court date next week for that charge. A hearing has been set for the Confederate flag altercation for September 9. 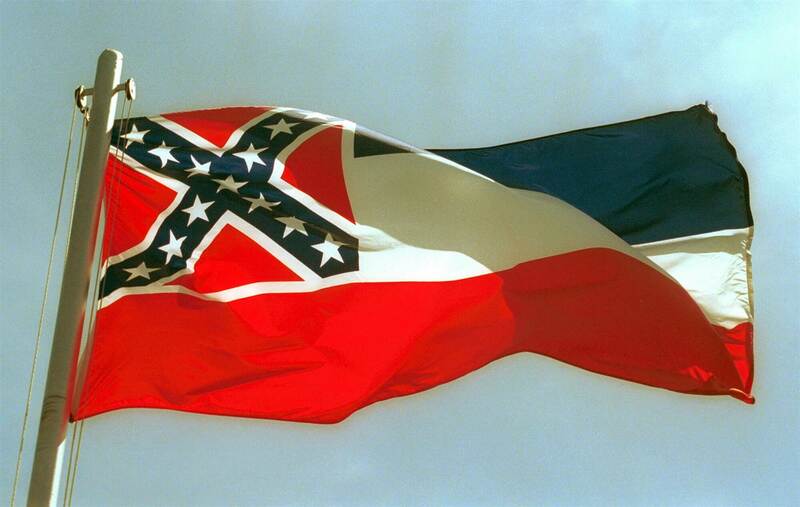 Another repercussion against the Confederate flag came last week when several current and previous Mississippi residents, who also happen to be celebrities, signed a petition to have the Confederate battle flag image removed from the state flag. Signatures included those of quarterback Archie Manning, author John Grisham, musician Jimmy Buffet, and actor Morgan Freeman. Governor Phil Bryant noted the vote taken by the state in 2001, when a majority ruled 2 to 1 to keep the flag. Because of it, the governor has no plans to call a special session on the matter. This just goes to show how little they really know about the Civil War and why it was fought. And no, it wasn’t fought to keep anyone’s ancestors enslaved. It would be interesting to know just how many Mississippians today truly had ancestors who were slaves. I’ll bet the actual number would surprise them. 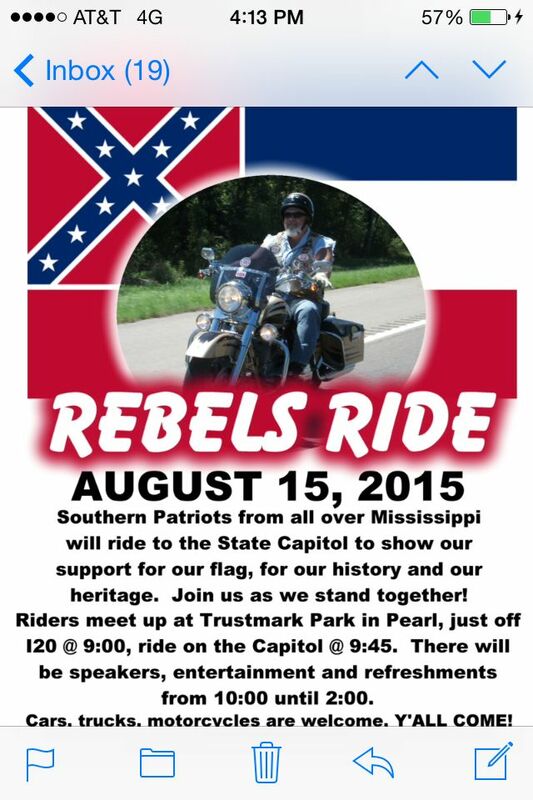 Last Saturday, a rally was held at the Mississippi State Capitol Building in Jackson to show support for the Confederate battle flag. 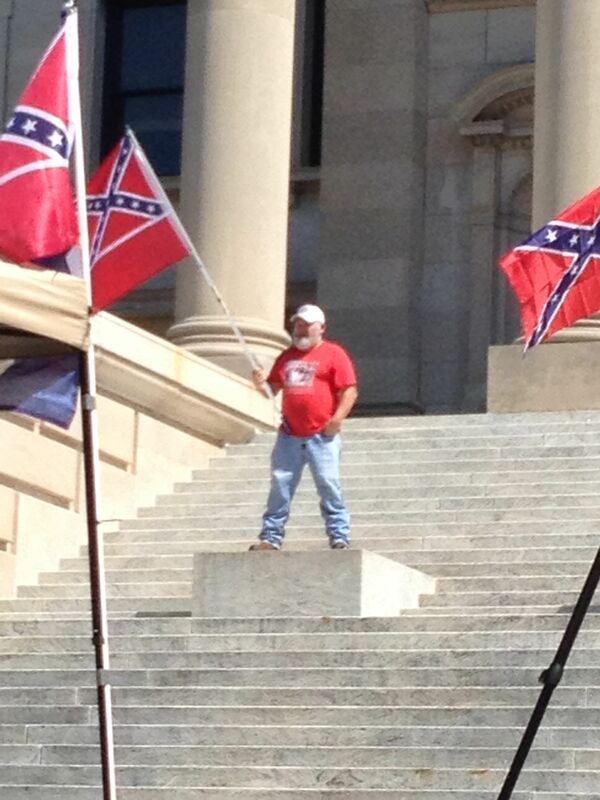 Rally goers gathered on the steps and quietly demonstrated their loyalty to the flag while “Dixie” played in the background. 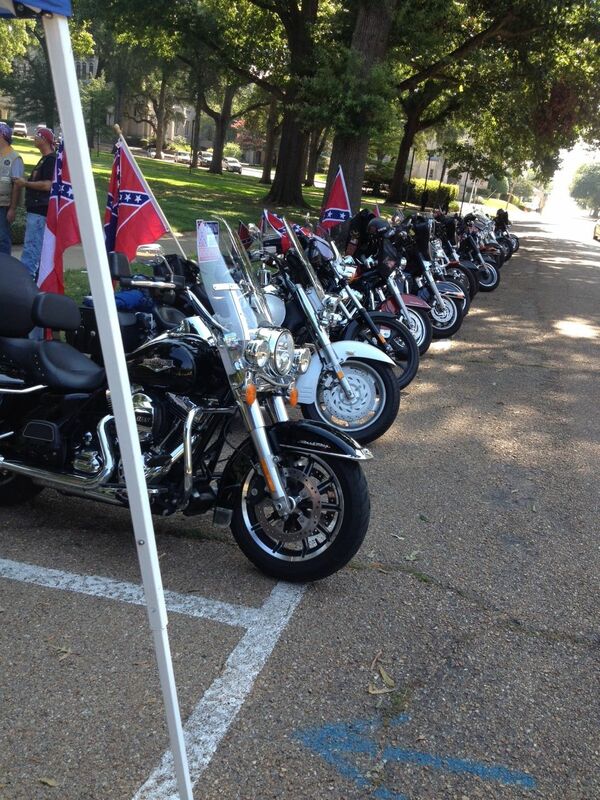 The mechanized cavalry rode through the streets of Jackson to display their devotion toward the South. All in all, it was a fun-filled, patriotic event. More rallies are scheduled this summer, so please stay tuned! I will be taking over the page, discussing my books and authorship in general, and interacting with other participants. I will also be holding a giveaway! So please check it out. See y’all there! Twenty-eight year old Katrina Jaitley is rebuilding her life after escaping an abusive boyfriend. The last thing she needs is the mystery she stumbles on during a bout of retail therapy. But she can’t ignore the coil of film — a piece of movie history — she finds hidden inside her purchase. Unfortunately, Peter, the handsome host of the estate sale, disappears before Kat has a chance to return it to him. Curious, Kat watches the strip and is shocked to witness the brutal murder of a famous 1920’s silent film star by a fellow actor. When a news article cites Kat as the film’s owner, her already complicated life goes from bad to worse. Someone is stalking her. Are they trying to silence her or what she has discovered? 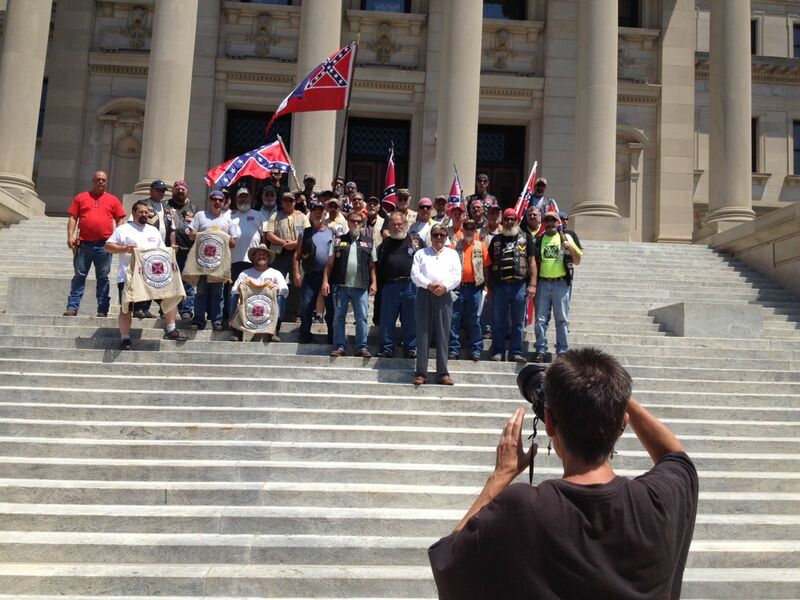 Over the weekend, numerous rallies were held in support of the Confederate battle flag. 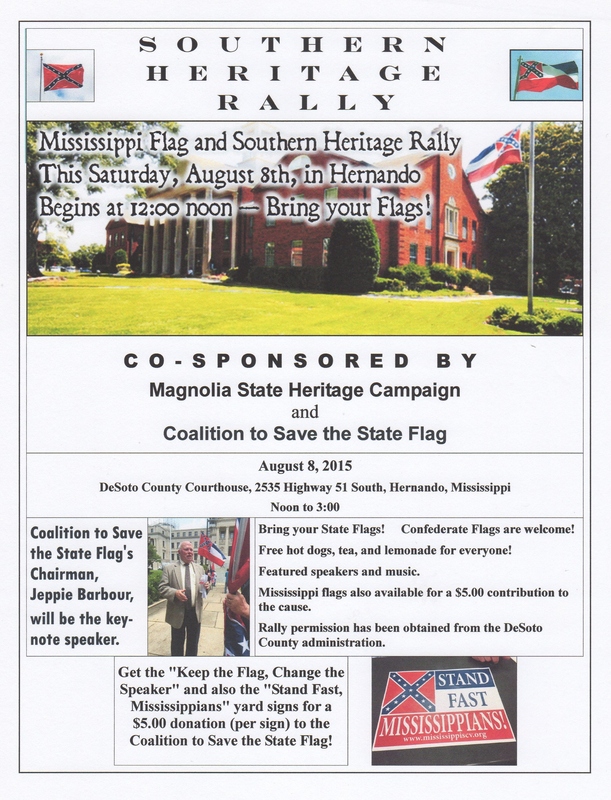 One such rally took place in Hernando, Mississippi, on the grounds of the town’s historic courthouse. Hundreds were in attendance to show their support, and display their pride in their Southern history and heritage. But that wasn’t all that happened last weekend. 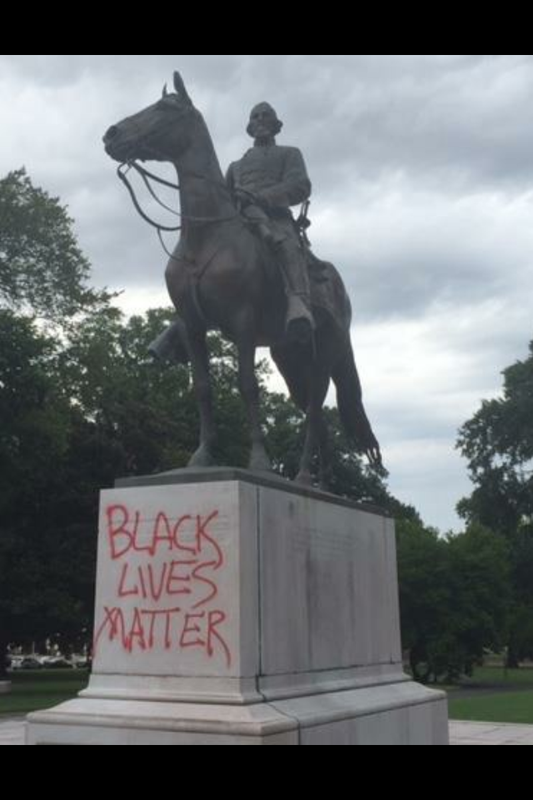 Vandals took it upon themselves to paint graffiti on the monument of Confederate General Nathan Bedford Forrest in Memphis, Tennessee, by writing “Black Lives Matter” on the base. This desecration is completely unacceptable, as the monument is located directly above the graves of the general and his wife in what was previously known as Forrest Park. 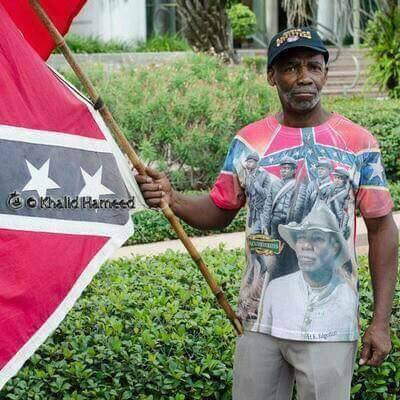 In 1906, the first of several laws was passed, declaring that Confederate veterans are American veterans. That means that, by desecrating Civil War (specifically Confederate) headstones, monuments, etc., it is the same as vandalizing those from WWI, WWII, the Korean War, the Vietnam War, Desert Storm, and other conflicts. To intentionally attack Confederate graves specifically is a rancid display of racism. The media is certainly feeding fuel to the fire. 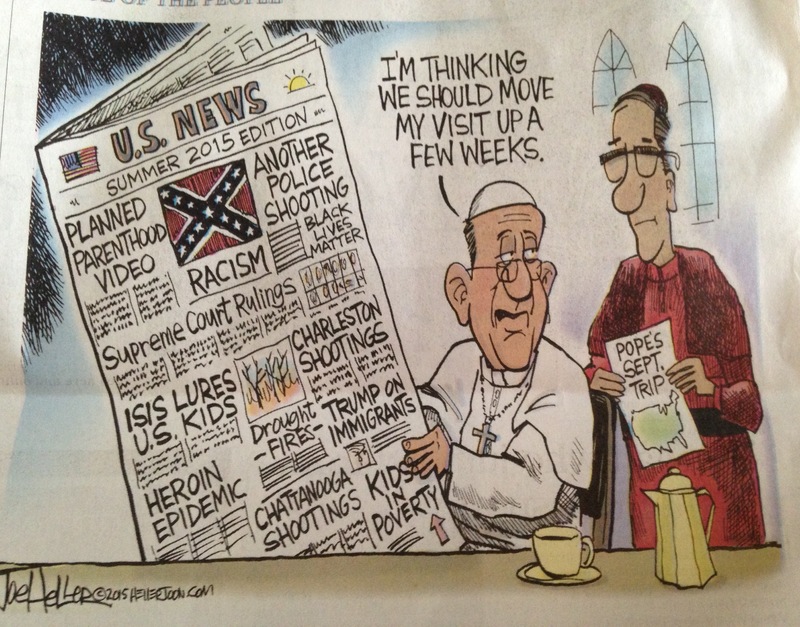 In a recently published cartoon, the artist depicts all that is wrong with America today. But the problem is that the Confederate flag is front and center, drawing the most attention, with the word “racism” plastered beneath it. For those who aren’t learned in Civil War history, most would assume the flag represents this deplorable act. However, the flag isn’t behaving in a racist way. On the contrary, those who are painting “Black Lives Matter” on everything Confederate are the true bigots. 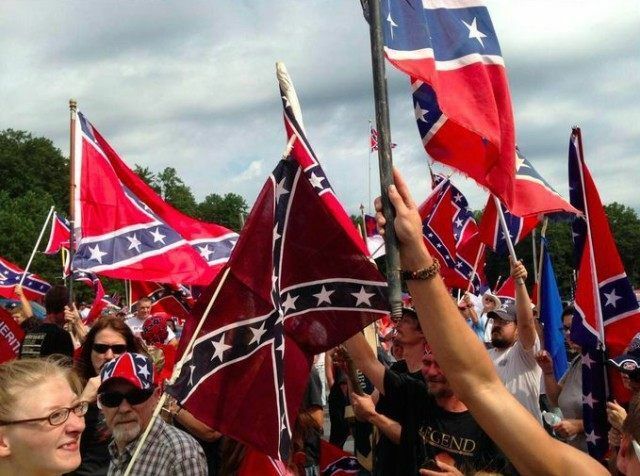 Last Saturday, hundreds upon hundreds of Southerners showed up at Stone Mountain in Georgia to support the Confederate battle flag at a rally. Stone Mountain is the country’s largest Confederate memorial, and has been targeted by the Atlanta chapter of the NAACP for removal. One of the rally organizers, Thomas Jewell, a black man, said that he rallies to the flag because it represents his Southern heritage. He is not offended by it, and knows that the flag has been misrepresented in the past. Many more rallies are scheduled in the coming weeks. One is scheduled to take place in Washington D.C. on September 5, and I’m sure it will have a huge turnout. This just goes to show how more people are defending the flag than are protesting its existence. 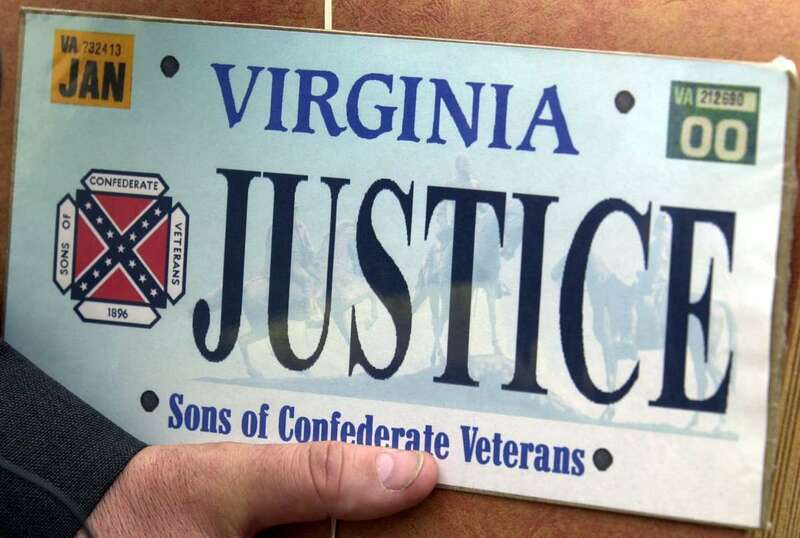 Posted in Uncategorized and tagged Atlanta, Civil War, Confederate, Confederate Battle Flag, CSA, Georgia, heritage, memorial, NAACP, racist, Southern, Stone Mountain, Washington D. C.
Last Friday, U.S. District Judge Jackson Kiser ruled that Virginia can refuse issuing specialty license plates which display the Confederate flag. This happened in lieu of a recent Supreme Court ruling, stating that such a ban does not violate the First Amendment. This ruling primarily targets the Sons of Confederate Veterans (SCV), whose logo is the Confederate battle flag. Judge Kiser said he will issue a written order, addressing whether the approximately 1,700 Confederate license plates that have already been issued will have to be recalled. However, attorney Fred D. Taylor, who is representing the SCV, argued that the Supreme Court ruling should not apply to Virginia, because the state doesn’t have a formal procedure for approving the content of specialty license plates. Therefore, specialty plates issued in Virginia could be interpreted as a form of free speech. The SCV is now involved with a similar case in Texas, which has gone to the Supreme Court. In 1999, the SCV sued Virginia over the use of their logo on license plates. Two years later, Kiser (the same judge who presided over last Friday’s hearing) enjoined Virginia from enforcing the ban, and concluded that it restricted free speech. The U.S. Court of Appeals later upheld that decision, but after the shootings in June at a church in South Carolina, a flurry of chaos ensued in regard to the Confederate battle flag. That may be true to some people, but not to others. Therefore, the ruling is discrimination. If one group is not allowed to use their logo, motto, or emblem, then NO groups should be entitled to do so. Fair is fair, and taking away the SCV’s right to proudly display their logo on specialty plates is unfair.